Permission was obtained from the owners of Elizabethan Pine to carry out a detailed examination of the cellar. Entrance is now through a trapdoor on the right-hand side of the shop, which is normally covered by a fitted carpet. Following refurbishment by the previous owners, the cellar is now quite dry, with a concrete floor. The roof has four diagonal ribs, with a continuous rib conjoined with two part-ribs, that enter the wall next to the stairs. All the ribs end on corbels about 50 cms. (18 inches) from the floor. The ribs and corbels are devoid of any carved decoration or bosses, and the infill is with cut stone. There are two doorways in the cellar, but both have been bricked up. That on the road side has early sandstone door pillars and a carved lintel; above this was the normal entrance from the road, similar to other Church Street properties. The stones at the bottom of the door have grooves where wheels or runners have worn them down. To the far left in a comer is a half-concealed window; the top of the stonework can be seen from the street just above the pavement near the comer of St. Mary’s Lane. In the past it could have been used as a coal-chute, but this seems unlikely if the entrance from Church Street was in use. 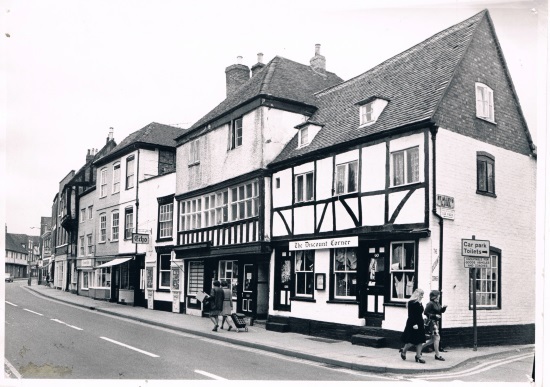 The doorway or opening in the wall facing Church Street was probably bricked up with stone when a property was built onto the rear of the shop. If the cellar was used as a dwelling this is where the fireplace or hearth must have been, as now there are only boards above the doorway, where the chimney stack would have been prior to the rebuilding in this century of the premises above. 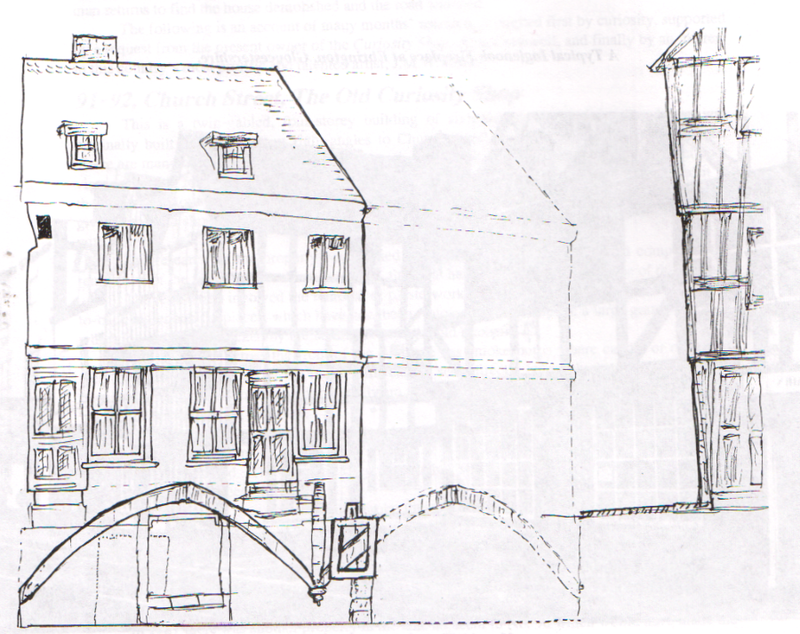 The only entrance to the cellar, the stairs, has a newly-built wall on the left, probably built when the house next to 90 was demolished about 1870, the cellar beneath filled in and the road widened. 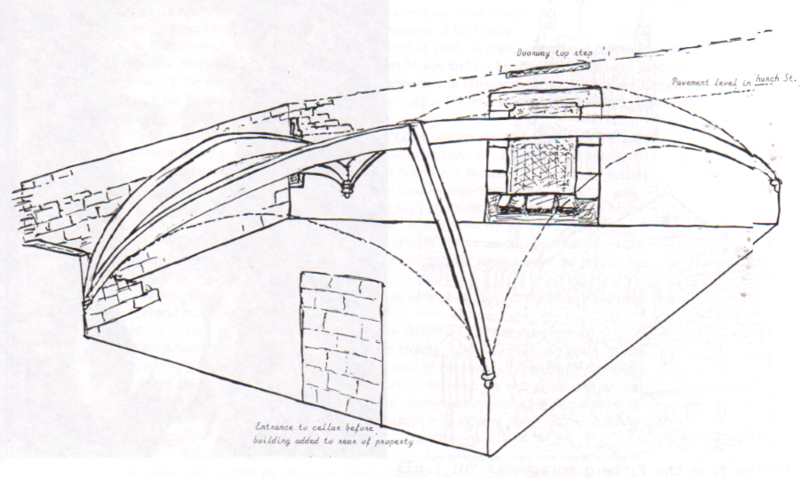 This would have meant the loss of about a third of the vaulted cellar, as is shown by a horizontal rib in the cellar, which would have been the middle of the twin quadripartite vaulted cellar. It can be clearly seen where three ribs join a corbel to the side of the window. Contemporary writings show that in the past the vaulted cellar has been many things, from the church of the townspeople, a St. Mary's outside the monastery, to a public house. The Victoria County History confirms that it is the oldest domestic building in Tewkesbury. This must have been a description of the chamber that is now filled in and under the road, possibly the last viewing before demolition. If, as suggested, it was a domestic property, Bennett was describing the main living accommodation and entrance, uncannily like the illustration of the vaulted cellar in Dickens’s Old Curiosity Shop. Richard Cooper; Head; Married; Male; 47; Maltster; Born Tewkesbury Glos. Martha Cooper; Wife; Married; Female; 45; Greengrocer & Wife; Born Bushley Worcs. William Cooper; Son; Single; Male; 22; Miller; Born Tewkesbury Glos. Mary Cooper; Daughter; Single; Female; 21; Day Labourer; Born Tewkesbury Glos. John Cooper; Son; Single; Male; 19; Maltster; Born Tewkesbury Glos. Josiah Cooper; Son; Single; Male; 16; Tanner; Born Tewkesbury Glos. Elizabeth Cooper; Daughter; Female; 7; Scholar; Born Tewkesbury Glos. Sarah Ann Cooper; Daughter; Female; 3; Scholar; Born Tewkesbury Glos. Ann Cooper; Granddaughter; Female; 4months; Born Tewkesbury Glos. Mathew Cooper; Son; Male; 1week; Born Tewkesbury Glos. James Ansel; Head; Married; Male; 60; Gardener; Born Stafford Staffordshire. Mary Ansel; Wife; Married; Female; 50; Born Tewkesbury Glos. John Ansel; Son; Single; Male; 33; Labourer; Born Tewkesbury Glos. James Ansel; Son; Single; Male; 22; Labourer; Born Tewkesbury Glos. Rose Ansel; Daughter; Single; Female; 19; Born Tewkesbury Glos. William Ansel; Son; Single; Male; 13; Born Tewkesbury Glos. Mary Ansell; Head;Widow; Female; 60; Born Tewkesbury Glos. John Ansell; Son; Single; Male; 40; Platelayer; Born Tewkesbury Glos. James Ansell; Son; Single; Male; 34; General Labourer; Born Tewkesbury Glos. Rose Ansell; Daughter; Single; Female; 21; Laundress; Born Tewkesbury Glos. William Ansell; Son; Single; Male; 20; General Labourer; Born Tewkesbury Glos. Charles Hodges; Head; Widower; Male; 63; B. Tewkesbury Glos. Sarah A. Devereux; Daughter; Widow; Female; 27; Grocer;b. Tewkesbury Glos; Working On Account. Ellen Devereux; Granddaughter; Female; 8; Scholar;b.Nottingham Notts. Charles T. Devereux; Son(sic); Male; 5; Scholar;b. Tewkesbury Glos. Ellen Smith; Lodger; Single; Female; 23; Machinist In Shirt Factory;Born Deerhurst Glos; Employed. Ann Hyatt; Head; Single; Female; 56; Upholsteress; Born Tewkesbury Glos. Mary Hyatt; Sister; Single; Female; 59; Charwoman; Born Tewkesbury Glos. Eliza Hyatt; Daughter; Single; 26; Upholsteress; Born Tewkesbury Glos. Mary Ann Hyatt; Daughter; Single; Female; 18; At Home; Born Tewkesbury Glos. Rebecca Davis; Head; Widow; Female; 52; Butcheress; Born Tewkesbury Glos. Ebenezer Davis; Son; Single; Male; 22; Butchers Son; Born Tewkesbury Glos. Rose Davis; Daughter; Single; Female; 20; Butchers Daughter; Born Tewkesbury Glos. Emily Davis; Daughter; Single; Female; 18; Dressmaker; Born Tewkesbury Glos. Ellen Davis; Daughter; Single; Female; 17; Butchers Daughter; Born Tewkesbury Glos. 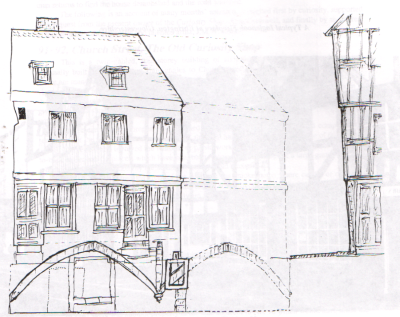 William Hawkley; Apprentice; Single; Male; 17; Butchers Apprentice; Born Tewkesbury Glos. John Murphy; Servant; Single; Male; 20; Butcher; Born Ireland. Charles Harries? ; Servant; Single; 20; Butcher; Born Tewkesbury Glos. Mary A. Stephens; Head; Married; Female; 58; Marine Store Dealer; Born Tewkesbury Glos. Charles Harris; Son; Single; Male; 3; Born Stafford Staffordshire. John Haines; Lodger; Widower; Male; 78; Framework Knitter; Born Tewkesbury Glos. Joseph Allen; Lodger; Single; Male; 38; Shoemaker; Born Temple Cloud? Somerset. John Birch; Head; Married; Male; 42; Tin Plate Worker; Born Oldcroft(sic) Glos. John Birch; Son; Single; Male; 19; Platelayer; Born Tewkesbury Glos. Fanny Birch; Daughter; Single; Female; 8; Scholar; Born Tewkesbury Glos. Ernest Birch; Son; Single; Male; 4; Scholar; Born Tewkesbury Glos. Alfred Birch; Son; Single; Male; 2; Born Tewkesbury Glos. *Elizabeth Birch; Wife; Married; Female; 36; Fruiterer; Born Admington(sic) Worcs.